Irukandji is dedicated to spreading awareness and making a difference for aquatic life through display, interaction, communication, education, research and action. Our ultimate goal is to dedicate our existence to conserving the ocean, its wild life, its natural systems and in turn conserve the Earths life source. Our grand mission has a dedicated team behind it, some of them are staff, some volunteer their time to the cause and some consist of the many thousands of people who walk away making some small changes to their local area/lives/planet as a result of all they experience here. However small the action is it is a meaningful one and every tiny bit counts. We like to call ourselves “Fluffy’s Army” after we were so named by a young girl. Whatever our location, background, age, position or financial situation, together we can make an awe inspiring impact in reversing the oceans destruction, one tiny piece of plastic at a time. 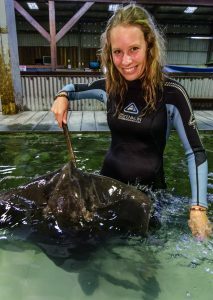 Volunteers can have a huge impact on the operation of the Attraction and our mission to help protect and conserve marine life. They can include high school and university students, parents, families, professionals and retirees. We are delighted to present a couple of opportunities throughout the year that will engage families that want to spend time together while conveying the value and importance of conservation to the next generation. 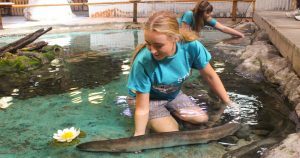 Everybody loves Fluffy our Tawny Nurse Shark! Lots of people promise Fluffy everyday that they are going to help clean up the plastic that will flow into Fluffy’s Ocean. You can help too and we will support you in your efforts. You can even be famous if you send us your photos we will post them on our website and our Facebook and Twitter!